Our bulky waste collection service is for items which cannot be recycled or disposed of in your household collection or communal bins. This includes items of furniture and household appliances. We charge for this service, but discounts are available for people over 60 and those receiving certain benefit payments. No Fly-tipping – putting items on the pavement for removal or beside a communal bin is illegal. Before you ask someone to collect an unwanted item, can you get rid of it another way? if you can get it there, take it to your nearest recycling centres. The organisations listed in the table below may be able to collect your unwanted bulky furniture and household goods for free. Use the contact details below to find out if they can collect your item/s and arrange a collection. Any small items need to be bagged or boxed up by material type if possible. For example, garden waste in a bag and toys in a box. This is because they are recycled by material type. We cannot collect building waste like rubble, asbestos, plasterboard, kitchen or bathroom units and storage heaters. A small amount of building waste from DIY can be taken to the recycling centres. If you have large amounts of building waste you should employ a registered waste company or hire a skip. Please take time to check the cost of the items you are looking to have removed. We normally require around two days' notice to ensure you get your preferred booking. We must be able to collect items safely and easily from your property. When you are ready, call KSD Group Environmental Services between 8am - 4.30pm, Monday to Friday on 01273 608142 to arrange the collection. We run 25 collections per day and at the end of the day the items are taken for recycling where possible or alternatively for safe disposal. Please place items for collection in an accessible place, close to the front of your property. Items that need to be broken down and/or dismantled must be done before the collection crew arrive. This will help to prevent cancellation of your booking and ensure the collection crew are able to complete the collection speedily. If you are over 60 years old, or receive any of the following, then we offer a 50% discount on the bulky waste collection service. In order to receive this discount we require your national insurance number when you book. This is used to confirm you are entitled to the discount. For a single collection the combined cost of the items to be collected cannot exceed £130, or £65 if you receive the discounted price. A Minimum collection charge of £10 applies per collection visit. Small chest of drawers, bed side table etc. 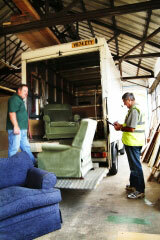 Any unlisted, bagged or boxed items will be quoted on the day and priced by size and weight. There is no obligation to use the service. If you are happy with the quote you can pay them on the day, if not then the team will leave without charge to you.